43855 EG52FGC Dennis Dart SLF / SCC from First Essex. Down as For Sale on Ebay in December were 40034 41132 42724 42725 48229 48233 48262 48267 48269. In the car park are 'preserved' (not by First) 1200, 34003 and 34198 but 34198 has a long list of defects and a smashed front upper deck window. 42825 also believed to be preserved at rear of parking. 34091, 42832 and 53009 withdrawn, 23318 ( f sw legals) Greyhound livery , 30876, 32715 all vor with major defects. 23324, (Could not see legals?) Greyhound livery in workshop. But the main vehicle of interest was N765PAE (photo) with f SW legals on Contract. 33174/33175 in depot branding removed 32851, 32853 back from TN , 32802 in full First Kernow looking very smart (photo). 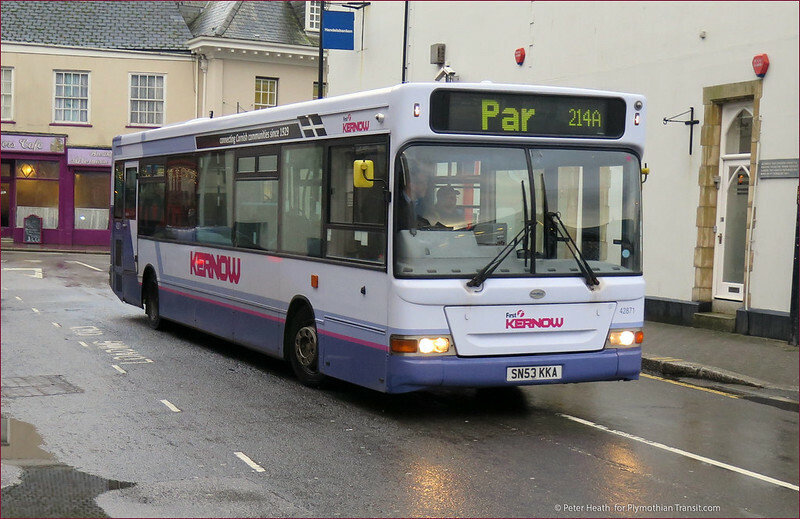 Note 23316/7 still in Greyhound livery. 42430, 42470, 42473, 52013 withdrawn. Open tops 38000/1/4/5/6 and another maybe 34137 parked with no covers. Also at the rear was an unidentified red coach. 53107 repaired and in Full Kernow livery. Withdrawn 38002 has gone from it's long term position in the yard. Photos of 43871 and 42871 in full Kernow livery attached. Could it just be that Stagecoach can see it paying? After all, they will have invested a lot of money in it. I am sure they feel they can do a better job than National Express as far as frequency is concerned and give First (trains, that is) a good run for their money on times and certainly beat them on fares. This sounds as though it will fit in with Megabus; eleven vehicles looks like an hourly service. I wonder if it will be registered as a local bus service - so old folks' passes can be used. 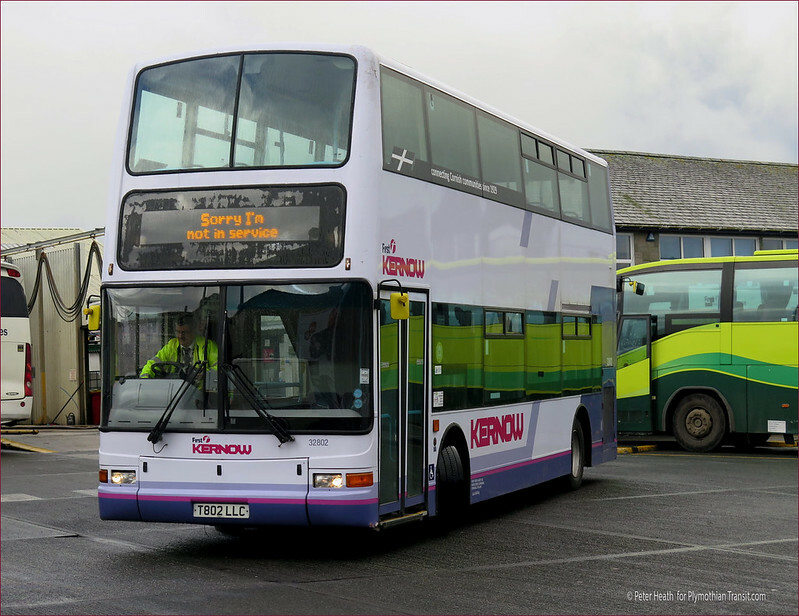 Any service starting in Cornwall would almost certainly go straight up the A30 and miss Plymouth completely. Oh dear. stagecoach obviously shouldn't trust their own business acumen. Clearly they should consult you first. What a mistake. 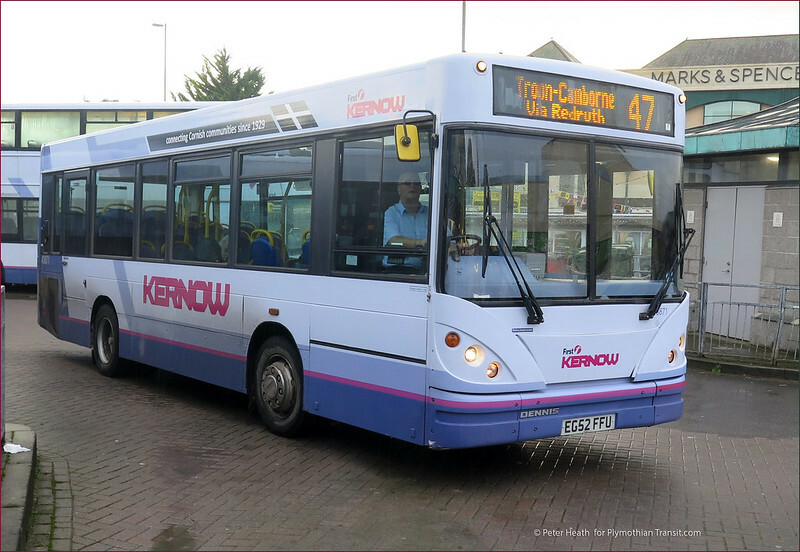 Good to see The Refreshed Kernow Fleet coming together,it's a pity that some of The Deckers coming from up Country are having trouble making it past Taunton,with a Lot of New Double Deckers being introduced in The First Bristol Fleet maybe 6 of The 53 Plate Wright Eclipse Gemini Deckers couldn't be sent to Kernow,less distance to Travel and would raise the Fleet profile. 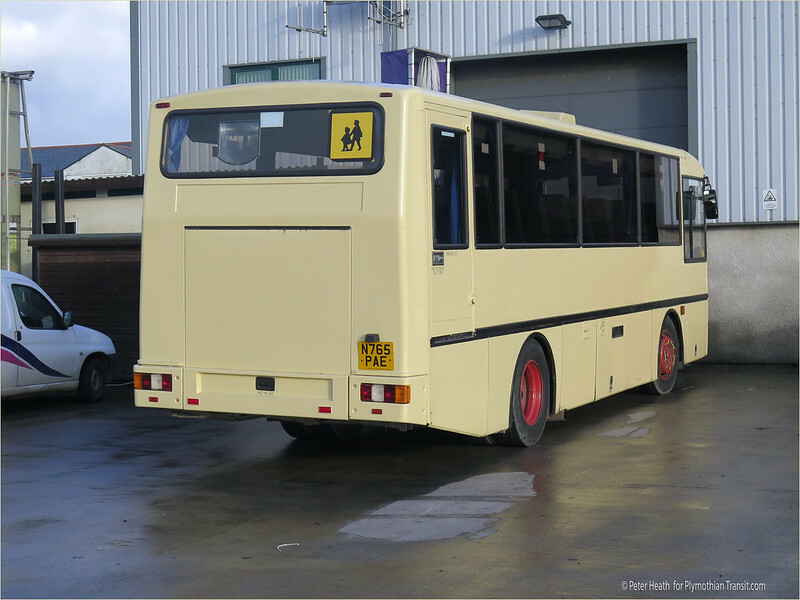 I assume the cream UVG Javelin is one of the vehicles recently acquired by First from Webbers Coaches of Bodmin the takeover of which was completed on the 5th Jan and is just being reported in the trade press. W315DWX has also passed to Bullock, Cheadle.